Disclaimer: I purchased the item featured in this post. Hey everyone, happy Saturday! I had a good morning filled with unnecessary naps today and as I am slowly get back to my readings and assignments, I'll take a few minutes to blog about a recent favorite product of mine from Lush. 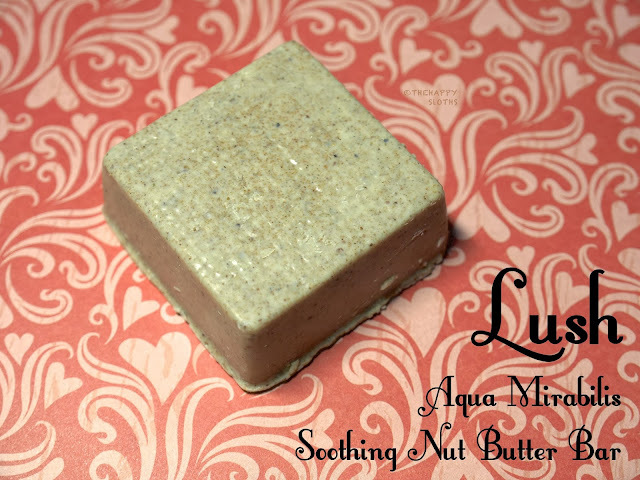 I picked up Aqua Mirabillis after trying the Sandy Santa (reviewed here) because I was looking for another scrub bar that exfoliates, moisturizes, and smells amazing at the same time. At $10.95, the Aqua Mirabillis Body Butter shower bar promises to gently exfoliate the skin and leave it feeling soft and moisturized. The bar is made from cocoa and almond butter with ground almond shells. In the shower the butters melt as the ground almond shells exfoliate, the bar lathers slightly, creating a creamy mixture on the skin. Aqua Mirabilis smells of sweet almond milk and I honestly just can't get enough of it, every time I pass by the bathroom I actually go pick it up and just hold it up to my nose; the smell is ridiculously addicting! In addition to the amazing smell, the bar is actually a pretty good scrub and I find that it left my skin feeling more moisturized than Sandy Santa. I still apply a body lotion after showering but this alone provides enough moisture. The only downside is the price of this bar. Since it only lasts around 10-15 showers (if you use it sparingly), $10.95 is quite a lot to pay in my opinion. Despite that, I will definitely repurchase this. Have you tried any butter bar from lush before? Do you like the idea of a scrubbing butter bar? Let me know in the comments below!